While looking at early 1900 clips for today's Steeplechase post, I found this 2 minute video that shows the action of a giant merry-go-round similar to the Luna Park one I showed in my last post, Unique Merry-Go-Rounds. It's right at the beginning of this video, Let's Go Coney! Island (1932) and used courtesy of British Pathe TV which has an extensive library of documentaries, movies and historical clips like this on YouTube. Images of Steeplechase rides fascinate me because the closest I've seen at present day midways are usually the type where you squirt water, or roll balls, into a funnel-type hole and the amount of balls, or pressure, moves your horse, or other animal, racing across the booth. But watching a horse race, and riding a horse in a race, are totally different experiences. 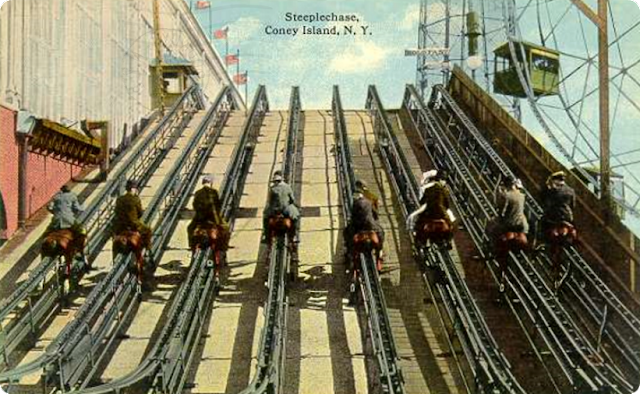 Steeplechase rides involved full-size horses which raced around an inside-outside track that often ran the circumference of the amusement park. They were fast, cozy rides where wooing men could hug their sweethearts as a safety feature without fear of reprisal. Children rarely rode alone, and safety straps weren't used until the third or fourth decade of the 20th century. 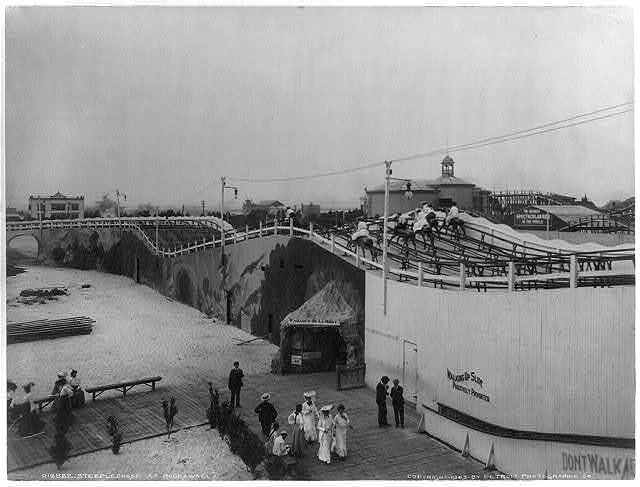 This black and white undated image from Wikimedia shows the Steeplechase Ride in action at Coney Island, New York. The Steeplechase Ride at Steeplechase Park opened in 1898 with 8 tracks, but a large fire consumed it in 1907. The rebuilt ride reopened in 1909 with 8 tracks as well, but they were on two levels of four each. Somewhere around the 40's and 50's one of the levels was taken down and the ride ran with 4 tracks until the park closed in 1964. It never reopened. The following 33 second clip of the Steeplechase Mechanical Horse Ride at Steeplechase Park is fun to watch, either here, or on the YouTube site where you can read the comments of people who actually rode this ride back in the day. I can't quote them here, but it's very interesting that the ride was fast and there wasn't much to hang on to. 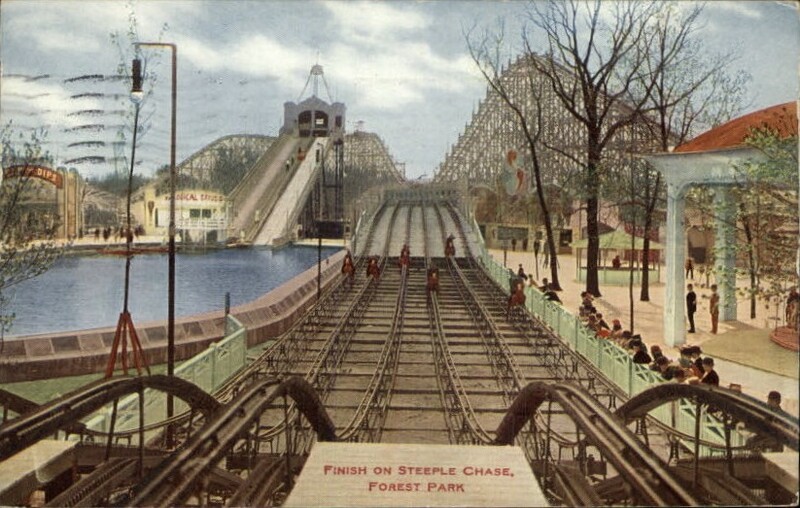 The Forest Park Amusement Park in Chicago, Illinois contained the only Steeplechase Ride in the midwest. Built in 1909, the 6-track ride was gravity-driven whereby the wooden horses were pulled up the incline by chain, and then allowed to glide down and around the track like a coaster. Since the more weight the horse carried, the faster it went, romance-hungry couples used the ride as a way to squeeze tight without raising eyebrows. Forest Park's Steeplechase Ride was half of a mile long and built between the Chutes lagoon and the Giant Safety Coaster, as shown in the following postcard. 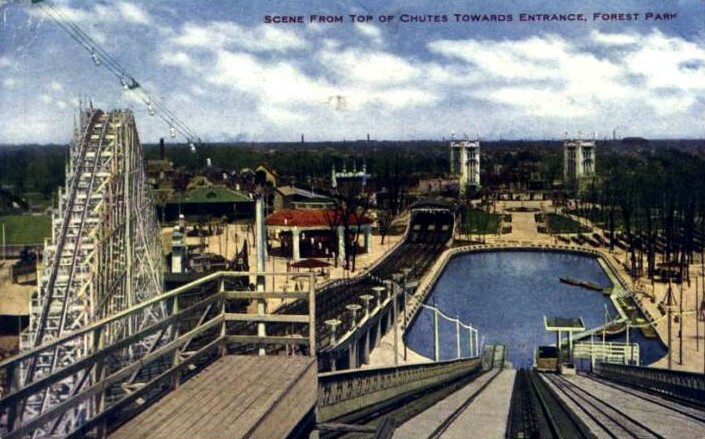 Both Forest Park postcards are courtesy of Living History of Illinois and Chicago Digital Library. 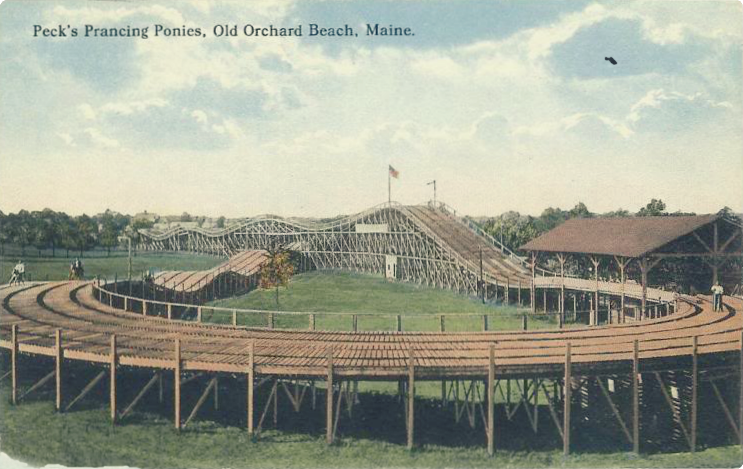 Peck's Prancing Ponies, Sea Side Park, Old Orchard Beach, Maine, undated. Get ready to ride the Steeplechase! Swing your leg over your very own horse and buckle up ready for a race with jumps, twists and turns. The Steeplechase is a one of a kind three lane steel coaster where there can only be one winner! Under the usual height and physical ability requirements, we see you need the ability to keep your posture under "dynamic conditions" as well as "withstand high G-forces and/or sudden changes in direction of forces." Basically, they are the same as for any high-speed coaster. Although the Steeplechase ride at Blackpool wasn't opened until 1977, it is a very good representation of the ones that have been torn down to make room for "improved" rides. Blackpool's version runs 3 parallel tracks for a length of 1500 ft with 30 mph maximum speed reached. The main difference I see between the original and the modern steeplechase rides is that the older ones weren't banked, therefore you didn't lean in and go smoothly around a corner, but stayed upright for a more jarring experience. And although I wouldn't want to lean over and stare at the pavement forty feet below, or another coaster crossing beneath my feet, I know that it's easier on the body if it's a smooth transition around the bend. I sure would like the opportunity to try out a steeplechase ride if I had the chance. 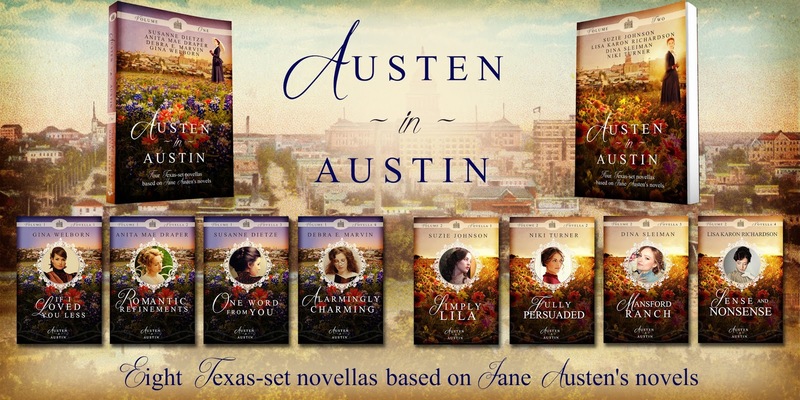 In celebration of this month's release of Austen in Austin Volume Two, I'm giving away either a print or digital copy (winner's choice) of Austen in Austin Volume One to one person who leaves a comment on this post before midnight, Sunday September 11th. Like the Austen in Austin Facebook page and keep up to date on all the giveaways of Volume One and Two. They look like a blast. And completely unsafe! I love the images you found. Thanks Anita. I love revisiting our Austen stories. Loved the videos! And yes! I would have tried the steeplechase if I'd had the chance. We never had one at any of the parks I went to when I was young, but I do remember when the local park had pony rides along a trail rather than the ones now where they just go in a circle. I was really surprised at some of the things women did in skirts in that first video. I know, eh, Vickie. I love watching the old videos because they give a true sense of the times. Old photographs are good, but people usually wore their best outfits and then sat for unnaturally long poses - not a true picture of real life. The videos however show spontaneous expression and examples of how the clothing reacted with body movements and other elements for a better picture of life back then. What an interesting post. I'd never heard of steeplechase rides, but as a "horse-crazy" girl I certainly would have loved them. These days I enjoy standing outside the corral and smiling as my grandchildren ride ponies at the local children's zoo. Thanks for stopping by and sharing that. Wow! Thanks for sharing these great videos! Those merry-go-rounds look like fun...well not the one where you are sitting up on the edge, but the one where you are in the middle waiting to be flung off. And the Steeplechase rides look like fun, too. I would prefer the modern version, for safety reasons. But alas, all rides are out for me, because of a bad back. Thanks for the opportunity to win this book. Oh, I hear you on the bad back. Not sure I'd want to be in that vulnerable position where I could get kicked, even if it looks like none of them are hurting. But my overall feeling is that it looks like "good, clean fun" and everyone is smiling, too. I have never heard of this before today! Oh my what a crazy ride that looks to be. I would totally do it! Thanks for the videos and pictures, it was fun learning about it. 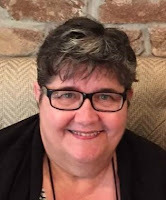 Anita, this was such a fun post! I loved the videos! Thank you so much for sharing! I've never even heard of these rides before! They look like such fun! I personally know quite a few people (including myself!) who would LOVE to try it out! Oh what fun!! What a fantastic post! And, yes. I agree. It would be fun to try out a Steeplechase ride! Would love to win a print copy of volume 1. Thanks for the giveaway!! LOVED this and all the history and old photos!!! Thanks for the giveaway. It's on my TBR list. Congratulations, Elly! You'll be receiving an email from me shortly. Thank you to everyone who responded to this post.